I would like to be a Physical Education teacher for the primary section. I have been witness to aggressive sports teachers, and I personally don’t want to be such a teacher. How can I learn to have a more positive influence on my students? Physical Education (PE) teachers are also ‘subject’ teachers. They should be qualified in their subject (like all other teachers) and should also be able to demonstrate the same kind of sportsmanship that they expect their students to imbibe. The sports teacher (whether male or female) must be as smartly dressed as the other teachers. Spending an enormous amount of time outdoors is not sufficient excuse for a compromise. Given the fact that the PE teacher needs to be physically active and agile, he/she should wear comfortable but smart clothes, such as a well coordinated track suit or other active wear in sober and tasteful colours. Remember, everything depends on the ease with which it is carried off! PE teachers must be extra cautious about dividing the class into those who can and those who can’t perform! Sports is meant to be enjoyed, even though students may be graded in the subject. Every student must be given the opportunity to participate. The caustic remarks that are hurled on the nervous or ‘incapable’ student, such as, “Can’t you even throw a ball?” or “Are you a tortoise?” are damaging, to say the least, and undermine the confidence of the entire class; they also make the student the laughing stock of the class. Worse still, the student will never be able to enjoy a physical activity, and will sometimes remain physiologically stunted! When a student is struggling with an exercise that he is not good at, or has not been previously exposed to, it is wrong and unfair to ridicule him. Instead, the student must be motivated to focus on another physical activity. The PE teacher should be as enterprising as the other subject teachers in having a number of activities up his sleeve. Remember that non-athletes are more interested in individual events where they can measure their level of improvement rather than compete against those who overwhelm them. A PE teacher has to be a mentor because this teacher, more than others, will be doling out tips on sportsmanship, on doing one’s best, outperforming oneself and others, and more importantly, how to take failure in one’s stride. Stroking the non-performers is a way of showing them that it is the effort that is more important in life than what one achieves. Talking, cajoling and scolding (but not taunting) are ways of getting students to love physical activity. Praising the ones who have the natural ability for the game, and lauding the efforts of those students who are going forward with trepidation but at the same time making an effort to enjoy the game are ways of making sure that students participate enthusiastically. 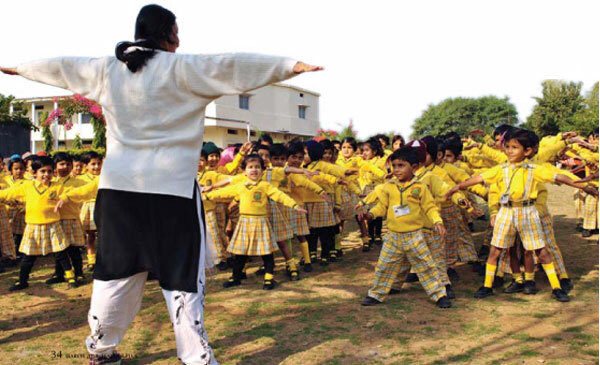 The PE teacher makes a very positive contribution in the physical development of the child. Therefore, the body language of the PE teacher must also be positive, encouraging and confident. A PE teacher roughs it out with the students, but that shouldn’t stop him or her from smiling and being friendly! Those who have been encouraged in sports are the ones who continue to exercise or take up a game at a later stage in life. It is these students who also take active part in sports and go on to win laurels for the country. It is not necessary to encourage students in English if language is a barrier. It can be done in any language the teacher and the student are comfortable in. A pat on the back, a smile or ‘Yes, you can do it,’ will make students go that extra mile for your game and for you. PE teachers have a tremendous responsibility – they are the ones who will make sure that the country has healthy future citizens. With a huge population like ours, we could have many more Olympic gold medalists once our PE classes become more motivating and less daunting, and our schools also understand what a pivotal role these teachers play in shaping the child!